A look back at the great flag debate of 1964. When Prime Minister Lester Pearson said Canada needed a new flag, the suggestions were mixed with protest. Rewind celebrates fifty years of our now familiar maple leaf flag. 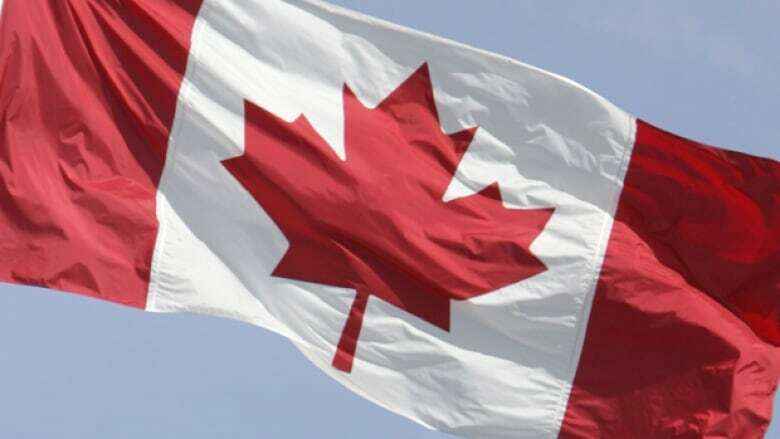 The flag recognized around the world with its red bars and stylized maple leaf on a white background is about as Canadian as you can get- right up there with maple syrup, lumberjacks and the Rockies. In the early 1960s, however, there was some serious opposition to the proposal for a new design. To mark National Flag Day on February 15, Rewind celebrates the Canadian flag with a look at its rocky inception and birth. Canada’s flag since before Confederation was the Red Ensign, based on a British naval flag. In 1958, a fraternal group called The Native Sons of Canada launched a campaign for a new one. In December 1958, the host of CBC Newsmagazine Norman DePoe spoke with J. Picard of the Ontario chapter of the Native Sons. His society had designed a new flag for Canada with a red and white background divided diagonally beneath a red maple leaf. 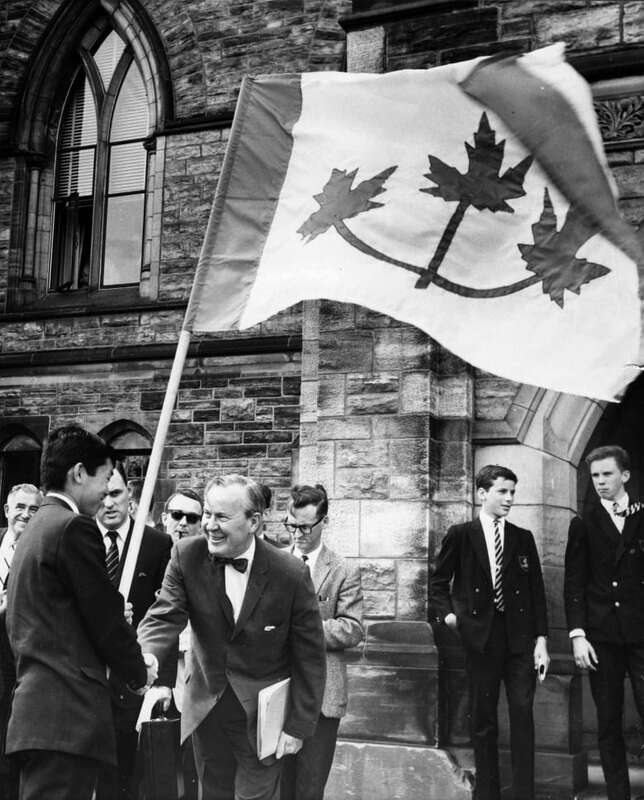 On May 14, 1964, Prime Minister Lester B. Pearson announced that he would introduce a new national flag. His preferred design had three red maple leaves conjoined on a blue or a white background. His second idea was a single maple leaf with blue bars on each side. A few days after his announcement he spoke at a convention in Winnipeg of the Royal Canadian Legion. The crowd was not pleased and he was booed. 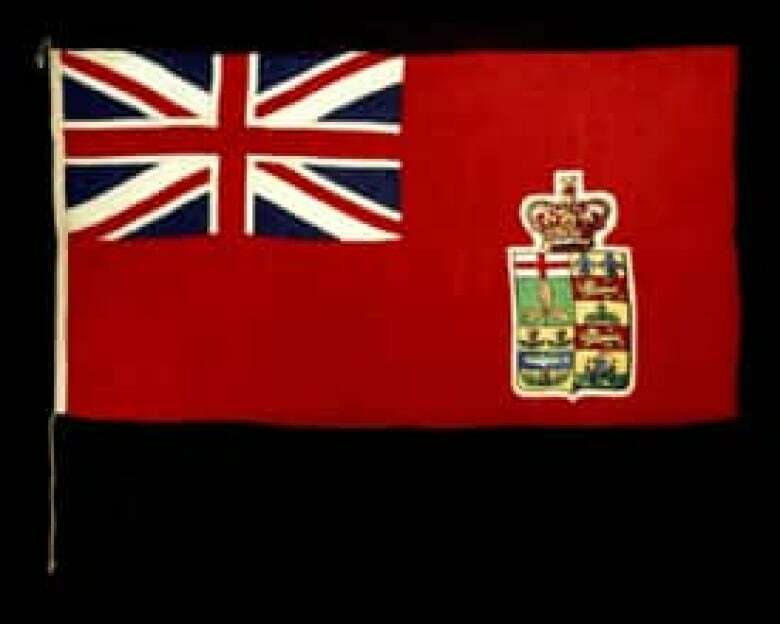 The flag debate divided English Canadians between imperialists who wanted to keep the Red Ensign, and nationalists who wanted a new flag. Francophones were generally ambivalent. On June 1, 1964, rival groups gathered on Parliament Hill to show support for, and opposition to, the proposed flags. They faced each other, booing and making catcalls. 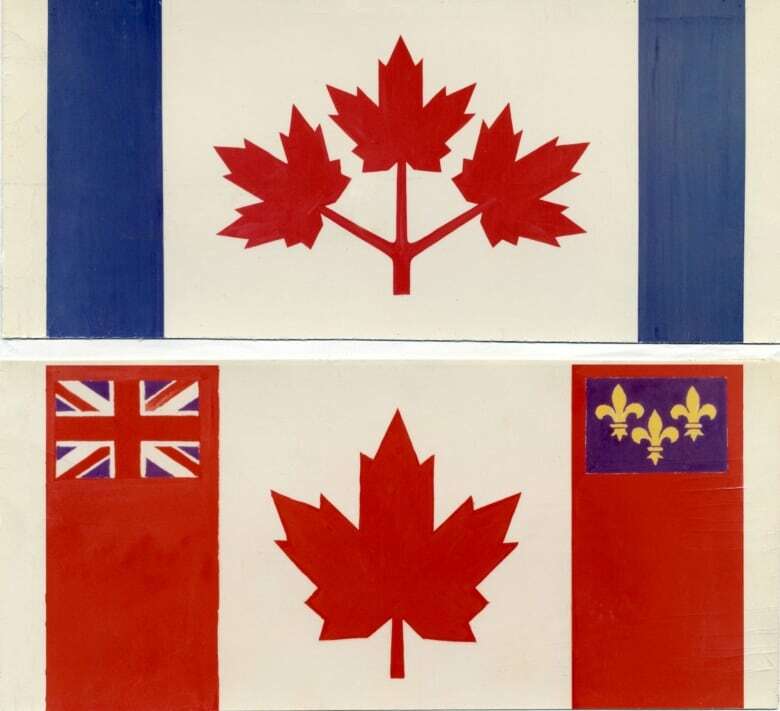 Canadians submitted close to 3,000 designs to the flag committee. British flags made up 14 per cent, while 60 per cent had maple leaves on them. Other popular symbols included fleurs-de-lys and crowns. Many had other traditional symbols: beavers, lakes, mountains, hockey players and Mounties. On December 15, 1964, after sitting for 210 days, the House of Commons voted for closure on the flag debate. The design ultimately chosen is the flag we know now as the Canadian flag. In fact, it's almost hard to think of it any other way. Liberal member of Parliament John Matheson helped develop the flag’s design and had doodled ideas for it in the House of Commons. On January 28, 1965 the Queen gave the new maple leaf flag royal assent. On February 15, 1965, for the first time in the country's 98-year history, Canadians raised our own official national flag. That day at noon on Parliament Hill, RCMP constable Joseph Secours lowered the Red Ensign and hoisted the new Maple Leaf to the top of the Peace Tower. Canadians across the country and abroad did the same. By the time the flag’s 25th birthday rolled around in 1990 there was a Conservative Prime Minister in office- Brian Mulroney. In spite of earlier opposition by Progressive Conservative John Diefenbaker, Mulroney celebrated the flag. But there was still one outstanding mystery. What happened to the first flag that ever fluttered on top of the Peace Tower? On Flag Day 2000, it emerged from hiding. 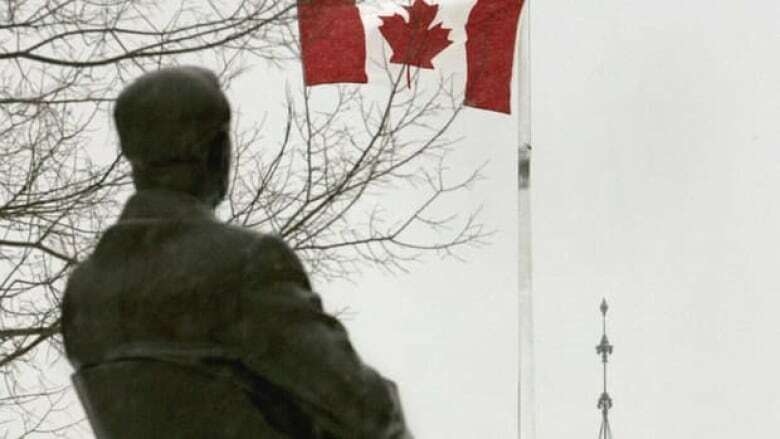 Prime Minister Jean Chretien told reporters that former Prime Minister Lester Pearson had taken the flag because he was proud of it and then quietly handed it down to his successor Pierre Elliott Trudeau, a tradition that continued until that day. However, Conservative leader Joe Clark said he didn't know where the flag was during his term as prime minister. Five years later in 2005, another of the original Peace Tower flags was located in Belgium. Elisabeth Hoffmann Lamoureux, widow of the former deputy speaker of the House Lucien Lamoureux, explained how the flag came into her possession. By the way, O Canada was declared Canada’s official anthem on July 1, 1980, one hundred years after it was first performed publicly. And one more fact for you: the government has a set of red shades that are used to create the "perfect" Canadian flag. The one that's best for outside use is weather-resistant "tomato red vinyl." Music was The Maple Leaf Forever from the group Finest Kind.